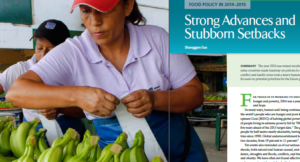 The 2014-2015 Global Food Policy Report released recently by IFPRI examines in detail the advances and setbacks in global food security in 2014 and prospects and priorities for 2015. Here, Denis Blight, Chief Executive of the Crawford Fund, provides a summary with a focus on the Indo-Pacific region. In an opinion piece to mark the celebration of the 40th anniversary of the International Food Policy Research Institute (IFPRI), Director General Dr Shenggen Fan acknowledged the incredible progress made in food and nutrition security. However he noted there is still much work to be done to sustainably and nutritiously feed a growing world population, which is reflected in this latest report, also written by Shenggen. Research and development, nutrition and sustainable intensification are identified as priorities. These are issues which have featured strongly in the work of the Fund. In fact, the 2015 Parliamentary Conference will focus on the business of food security and the nexus between profitability and sustainability. The goal of cutting the share of hungry people by half – met in 64 developing countries since 1990 – is nearly attainable; global undernourishment has fallen to 11 per cent. Yet serious and continued vulnerability remains to natural and human-caused shocks and other risks such as the Ebola epidemic, drought, floods, conflicts and overweight and obesity. Policy-makers and other actors from countries rich and poor must recognize the need to bolster our systems and institutions. Countries in South Asia took steps to combat poverty and hunger including through subsidized food grain to two-thirds of India’s population (but the program must be managed to reduce overall cost and ensure it promotes good nutrition). India also enabled its country’s poor to open 75 million bank accounts a first step in increasing poor people’s participation in the financial system. Pakistan by partly guaranteeing credit for smallholders aimed to bring the poor in the financial system – effectiveness and long term financial viability will need to be monitored. Nepal adopted a 20-year Agricultural Development Strategy to reduce poverty through agricultural growth. Bangladesh approved the commercial cultivation of genetically modified Bt eggplant. Africa showed solid economic growth and has slowly pushed down rates of poverty and hunger. Increasing foreign direct investment has contributed to economic growth and development, and Africa’s share of global trade in agricultural products has been on the rise and trade within Africa is on the upswing albeit from a low base – African markets now account for 34 per cent of agricultural exports. East Asia grew rapidly in 2014, at 5.7 per cent. China signaled a shift away from a traditional emphasis on food self-sufficiency toward heavier reliance or trade and also strengthened farmers’ property rights. Progress was made in reforming global trade rules. Nutrition assumed a higher profile in 2014 and factors such as drinking water and sanitation, the role of women and the quality of care giving recognized as part of the mix. Malnutrition is now understood to include not just hunger and micronutrient malnutrition but also over nutrition manifesting as overweight and obesity. Syria’s neighbours notably Lebanon and Turkey which each hosted more than 1 million refugees and Jordan more than 600,000. A funding crisis at the WFP, briefly halted assistance was restored temporarily by an emergency appeal. In West Africa a food crisis emerged from the largest ever outbreak of Ebola that infected more than 20,000 people, wreaked havoc on agricultural production, harvesting, transport and markets and contributed t a rise in food prices. Large movements of refugees fleeing violence in the Central African Republic, Mali and northern Nigeria were made worse by low rainfall and drought in neighbouring countries and threatened food and nutrition security in both hosting communities and refugees. Abnormally high temperatures in Sudan and South Sudan, which were embroiled in civil war in 2014 strongly, raise the risk of conflict. In other countries such as China and Vietnam, where manufacturing and services are beginning to replace agriculture as economic drivers and the task is to make farming more profitable for those with commercial potential while helping others to move out of agriculture into other productive work. If the international community is to end hunger and poverty once and for all it must not only agree on Sustainable Development Goals but commit to improving the well being of all the globe’s citizens. The outcome of the global climate talks in Paris in 2015 will have critical implications for future food and nutrition security. The Group of Seven countries under Germany’s leadership will continue to play a large role as collective donors and must maintain the momentum created by Canada, the United Kingdom and the United states to accelerate progress. This role goes beyond aid to include knowledge sharing, learning and cooperation. More shocks are in store in 2015 driven by climate change, oil price volatility and consequent food price volatility. More broadly, evidence and expertise make clear the need for policy changes. We need to produce more food, but our food production must be linked to better nutrition and must be accomplished sustainably. Only innovations in policy, institutions and technology will make this feasible. At the same time, we must curtail waste and poorly targeted agricultural and food subsidy programs in order to release national budget resources for more effective programs and resources. We face a double imperative: we must end hunger and malnutrition, and we must do so sustainably.